UPS (United Postal Service) is one of the most desirable logistics services. They are widely known for their affordable shipping methods, top-notch service quality, and best-in-class package handling. UPS also serve over a much wider network of delivery services when compared to other carriers or logistics. And it’s very useful for the online stores that deal with both domestic and international orders. 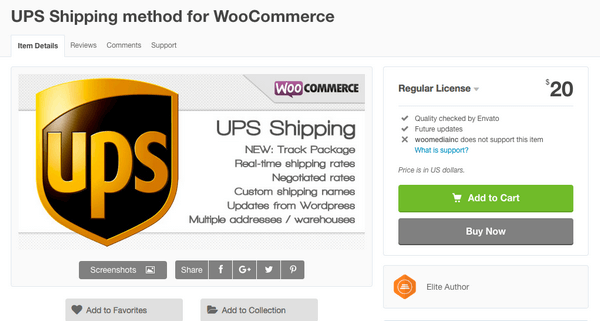 In fact, quite a lot of WooCommerce store owners prefer to use plugins that support UPS shipping. WordPress, with so many different plugins to choose from, it can be an overwhelming job for users out there to choose the right UPS shipping plugin. 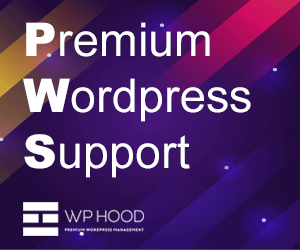 Therefore, to help you out, we have listed out the top 5 premium WooCommerce UPS shipping plugins. So read along and find the right one for your business and see ways to improve conversion rate. This plugin by PluginHive works using the official UPS API. So the plugin will only show accurate shipping rates. You can even adjust the returned shipping rates by either adding/subtracting a value or providing a certain discount. The plugin also lets you choose the label format and print the shipping labels directly from the WooCommerce admin side. You can even choose to automate the entire label printing process. The plugin offers UPS Freight shipping. So if your order qualifies as Freight (150 lbs or more), then you have the option to ship them as well. The plugin allows you to choose from the three packing methods – Weight-based, Box Packing with custom Weight and Dimensions and Individual Packing. Using the right packing method, you may save a lot on the shipping costs. The plugin goes a step further by integrating the shipment tracking feature into the plugin. With the automatic email functionality, your buyers will receive the shipment tracking details attached to the order confirmation email. PluginHive also provides excellent support to their customers and the cost of the plugin for the single site is $69. Option to Set Customer Classification Code. Enable Insurance(Set your own insurance amount for every product). Choose UPS standard packaging options. Set fallback rate in case UPS doesn’t return any rates. Supports Direct delivery option at the product level. 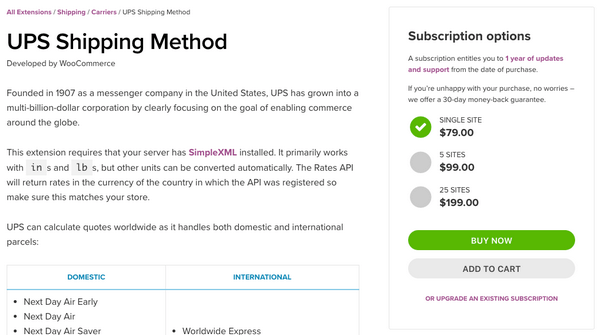 This UPS shipping plugin is from WooCommerce. Store owners can show the shipping rates for both domestic and international addresses based on the weight of the package. This plugin offers two packing methods to choose from – Box Packing with custom Weight and Dimensions and Individual Packing. While the plugin offers two packing methods, they are however not sufficient for most of the business cases. The UPS Shipping Method for WooCommerce by Woomediainc is a better choice for users who are looking for a cheaper deal. The cost of this plugin is just $19 and it is being sold by Evanto. Just like the other two plugins mentioned above, this plugin also shows the real-time shipping rates directly from UPS. 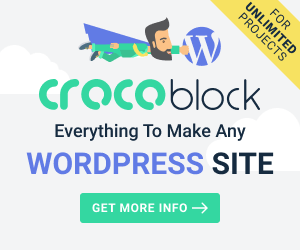 This plugin also works seamlessly with both Domestic and International packages and supports any currency, dimensions and weight units worldwide. It has a box packing algorithm that will calculate and decide which and how many boxes should be used to pack the items in an order. If you have multiple addresses or warehouses, then you can add it in the plugin settings. The shipping rates are directly calculated based on the shipping method and the destination address. And if you wish to rename any of the shipping methods, then you can do that as well. But with all these amazing features, the plugin does not offer any support to its users. However, you will continue to receive timely updates for the plugin. 3 ways of handling the shipping, Per Item, Weight of all items and Box Packing. Choose which shipping methods to show at the checkout. The WooCommerce UPS Shipping Plugin is a nifty little plugin that offers a wide variety of shipping services. You get real-time rates and in order to fetch the rates, your customers have to enter the correct shipping country, state and Post/Zip code on the Cart/Checkout page. One of the best features of this plugin is that you can choose to offer UPS shipping on certain items. Moreover, if you are using any other of their shipping plugins like USPS, then you get a drop-down option on the product page. This drop-down will allow you to choose the shipping carrier for each product in your store. The plugin also comes with a conditional shipping rule that is really useful. You can set an order limit(amount) and if any of the orders cross this limit, the plugin will show the Free Shipping option instead of the UPS Shipping. So, if you willing to buy this plugin then you would need to pay an initial amount of $40 and then, it is $29 per year. IgniteWoo has come up with a UPS Shipping solution for WooCommerce users. It offers features like UPS Shipping rates and allows store owners to limit shipping to desired countries. The plugin allows you to add the handling fee once and it gets applied to all the returned shipping rates. You can also choose the UPS pickup method and select the box packing type right from the plugin settings page. The plugin also allows you to set up UPS negotiated rates and supports all UPS parcel rates along with UPS SurePost. You can also include the Declared package values along with the shipping cost. 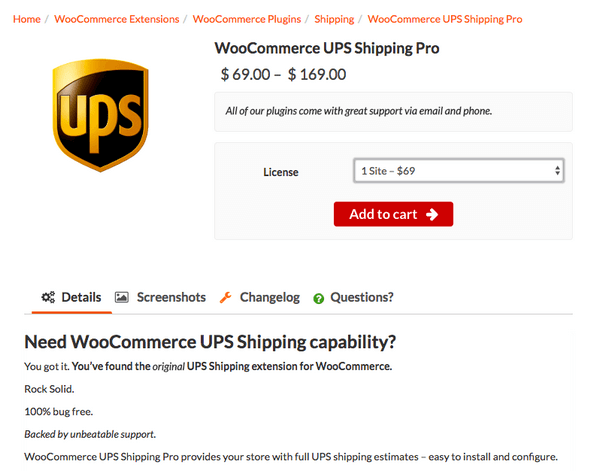 WooCommerce UPS Shipping Pro, however, does not come with the print shipping label and shipment tracking features. The cost of the plugin for the single site is $69, 2-sites is $79, 5-sites is $89 and for 25-sites is $169. Lets you add fees that are added to the UPS rates. Fees can be a flat rate or percentage of the shipping rate. WooCommerce has changed the way we handle our orders. And there are many numerous shipping plugins that can help you with it. So it is in your hands to choose the right one. This article was a guide to help you with selecting the best UPS Shipping plugin for your WooCommerce store. So if you find any one of them useful for your store then you can go ahead and buy one.